Hollywood is planning to make a movie about the six Bulgarian medics who were jailed in Libya for deliberately infecting children with HIV. The five nurses and a Palestinian-born doctor, who served eight years of the life sentences they received, had always maintained they were innocent. They were released from prison last month after Libya and the EU spent years negotiating the issue. The film will also focus on the children who were infected with HIV. The medical workers said they were tortured into confessing to deliberately infecting hundreds in 1998. 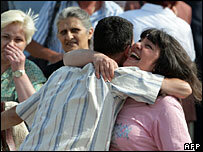 They were freed into Bulgarian custody in July and were immediately pardoned. The movie will be made by Sixth Sense Productions, which was involved with the Oscar-nominated genocide drama Hotel Rwanda. "The world will see the truth. The world must see the truth. Such a case doesn't happen every day," said Dr Zdravko Georgiev, husband of one of the nurses. He was acquitted in 2004, but not allowed to leave the country until last month. Sam Feuer, president of production for the company, said the story of The Benghazi Six would be "inspirational". Speaking to Reuters, he said: "The world needs to learn about this injustice. It's not just a Bulgarian story, it's a human story that the world will relate to and learn from." Mr Feuer confirmed his company is approaching some Hollywood stars. "Our job is to develop the best script possible that will attract them," he said. He said Sixth Sense has been in talks with Ann Peacock, who wrote the screenplay for The Chronicles of Narnia.